Jewish Home representatives file police complaint over cartoon in haredi newspaper depicting Rabbi Eli Ben-Dahan as a hangman. 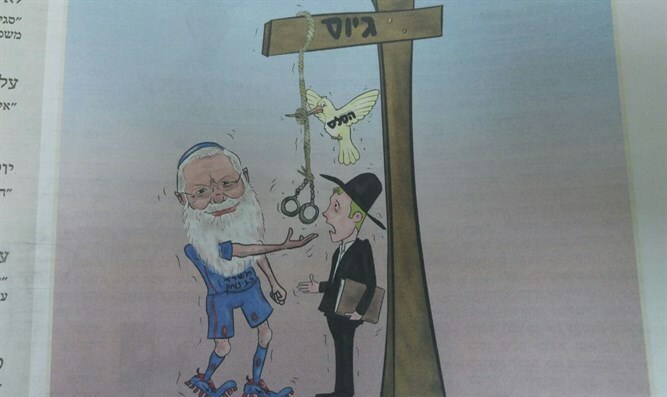 Hapeles, which is the mouthpiece of the Yerushalmi faction headed by Rabbi Shmuel Auerbach, which is vociferously opposed to any compromises regarding efforts to draft yeshiva students, last week published a caricature portraying Rabbi Ben-Dahan as a hangman targeting innocent yeshiva students. The caricature was referring to a letter that Ben-Dahan had sent to Attorney General Avichai Mandelbilt, demanding that he work to stop haredi incitement against army draftees. Amiad Taub, the chairman of Jewish Home's Council of its branches who initiated the complaint, said, “We regret the dismissive attitude toward our representative, Deputy Defense Minister Rabbi Eli Ben-Dahan, and demand that the representatives of the haredi public in the Knesset and in the government sound their voices loud and clear on the matter and make clear that incitement is unacceptable."